The House Homeland Security Committee held a hearing on "Taking Down the Cartels" this week. Predictably, several committee members called for the quick extradition of Joaquin "El Chapo" Guzman. 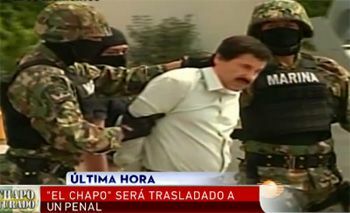 Many now believe that Chapo voluntarily turned himself in, that the commandos who went through the building at four in the morning, according to witnesses, were there simply to guarantee the operation’s safety while all the appropriate contracts and agreements were signed, that Emma Coronel was there to say good-bye. This version does not attempt to explain why Guzmán would feel like ending his life at large, with the prospect of a lifetime of solitary confinement in a US prison before him, but there are many other views about how and why Guzmán was snared. Joaquin "Chapo" Guzman-Loera won't be leaving Mexico anytime soon. A judge has ordered him to stand trial in Mexico. The judge said Tuesday that Guzman will stand trial on drug trafficking charges. Mexico's top officials say he must face all local charges and interrogation by investigators looking to dismantle his multibillion-dollar cartel before possible U.S. extradition. The U.S. will have to wait. "There was no involvement of any single person, everything has been by special operation of the Navy of Mexico (...) I have not heard of anyone from the U.S. government and any statement about this is clear because there is not" , he said. While prosecutors in Chicago and the Eastern District of New York vie to extradite Chapo Guzman, they may have to cool their heels. Mexico has filed new charges against Guzman. More on his capture and the wiretaps and tunnels here and here. Joaquin "El Chapo" Guzman Loera, leader of the Sinaloa cartel, has been captured in Mazatlan, Mexico. Guzman, accompanied by a female, was captured in a joint operation with Mexican marines and Drug Enforcement Administration authorities overnight at a hotel in the beach resort of Mazatlán. The operation had been in the works for four or five weeks, the official said. Will he stay in custody long enough to be extradited to the U.S.? He's facing multiple Indictments in the U.S. Which District will they take him to first? Perhaps San Diego?